Dimensions & Weight Head: 17 3/4″ W, 10″ H, 9 3/4″ D; 35 lbs. 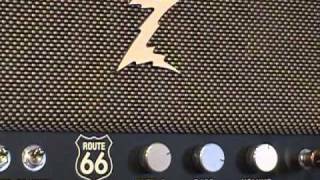 The Route 66 is an all original Dr. Z design based on the incredible KT-66 tube originally built by Genelex. This tube generates the “Milkshake Thick” tones, as heard on John Mayall’s “Bluesbreaker” album featuring Eric Clapton (the “Beano Album” as it is known to many). This is not a duplicate of the Marshall JTM-45, but completely original spin with new tonal end results. The Route 66 has an EF-86 front-end. For those not familiar with this tube, it is a 9 pin pentode that offers incredible gain and input dynamics. It is normally used in high-end stereos, most often for its accurate transfer of input signal, balance, and headroom. 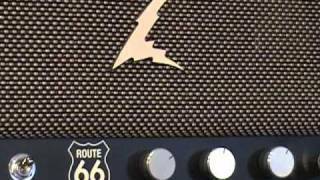 The Route 66 features a deceptively simple tone stack, consisting of Volume, Bass, and Treble, which feeds a non-negative feedback Phase Inverter, for true harmonic content and full output tube dynamics. It has a 5U4 Tube Rectifier to complete the round enveloped tone. The amp has piano-like clarity with endless sustain, even at low volumes. Its 32 watts truly sing when driven hard in a focused, thick distortion, with the tightest bass response you’ve ever heard. 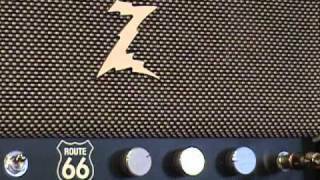 Guitar Buyer magazine provided usw ith a review of the Route 66. The Route 66 received the first ever “Editors’ Pick Award” from Guitar Player Magazine. 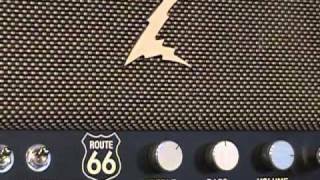 When Jeff Jourard brought this Route 66 over I was semi-disinterested…..simply because, frankly, I’ve never played an amp made after 1971 that I could stand. 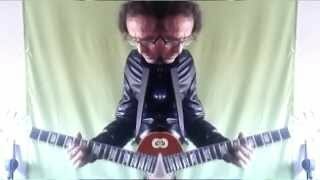 So he plugs it in and $%#^…..immediately the jaws drop, and we start busting out old Strats, old Les Pauls, old SG/LP’s …didn’t matter, they ALL sounded great, no, spectacular!. So much compression, sustain, harmonics, touch, AND when you turned down the guitar, that damned amp cleaned up without losing apparent volume to 50 fabulous shades of dirty to semi-dirty to clean. Received my new 66 (the black in black I ordered). Plugged into your 1×12 with Celestion Gold. Pure sweet beautiful tone. Still gotta try the more creamier 90W Creamback AlNiCo, but it’s gonna be super, I can tell. Now proud owner of a Ghia, a Wreck, and a 66 (with numerous “Z” cabs -1×12 w/Gold, 1×12 w/AlNiCo Creamback and a 2×12 with Greenbacks-). I got all the tones I want or need! Needless to say, I am absolutely 100% satisfied beyond expectations with you, your company, and your products. If I can help you beyond recommending your amps, just let me know.